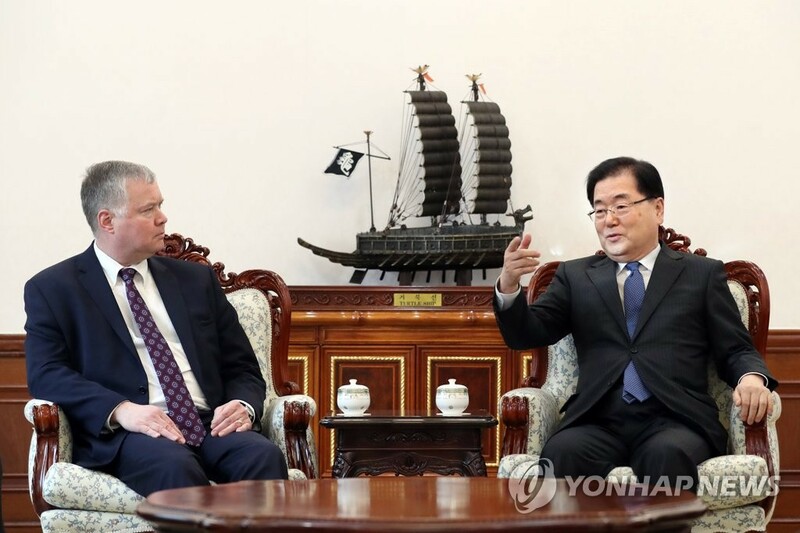 The U.S. envoy for North Korea visited Cheong Wa Dae on Monday for a meeting with the top security adviser to discuss details of an upcoming second summit between Washington and Pyongyang, South Korea’s presidential office said. The meeting comes ahead of Biegun’s working-level talks with his North Korean counterpart Kim Hyok-chol on Tuesday at the truce village of Panmunjom to prepare for a second summit between U.S. President Donald Trump and North Korean leader Kim Jong-un. According to Cheong Wa Dae, Biegun explained to Chung where the U.S. stands ahead of Tuesday’s meeting. In turn, Chung told the U.S. envoy about South Korea’s assessment of the current situation and what Seoul and Washington have to do together going forward.